Hi, my name is Haley Huang, and I’m an undergraduate biomedical engineer graduating in May 2015. Because a large portion of my coursework has been devoted to thinking outside of the box, I look forward to applying a unique problem-solving perspective towards answering some of the questions regarding ancient pottery techniques. Through “Recreating Ancient Greek Ceramics,” I hope to learn some of the stories behind our phenomenal collection of artifacts, as well as discover a deeper appreciation for the craftsmanship of ancient potters. Apprentices work on their first tiles. Photograph by Ross Brendle. –Eleni Hasaki in “Craft Apprenticeship in Ancient Greece: Reaching Beyond the Masters.” In Archaeology and Apprenticeship: Body Knowledge, Identity, and Communities of Practice, edited by Willeke Wendrich, 171-202. Tucson: U of Arizona, 2012. It’s during this third week that we finally began to understand the complexity and difficulty behind the creation of our ancient cups. After a short 15-minute bus ride from campus, we arrived at Baltimore Clayworks, the epicenter for our apprenticeship. Our graduate student mentor, Ross Brendle, led a brief discussion on ancient apprenticeship models and attributions to ancient master potters before we turned to modern master potter, Matthew Hyleck, for an introduction to ceramics. 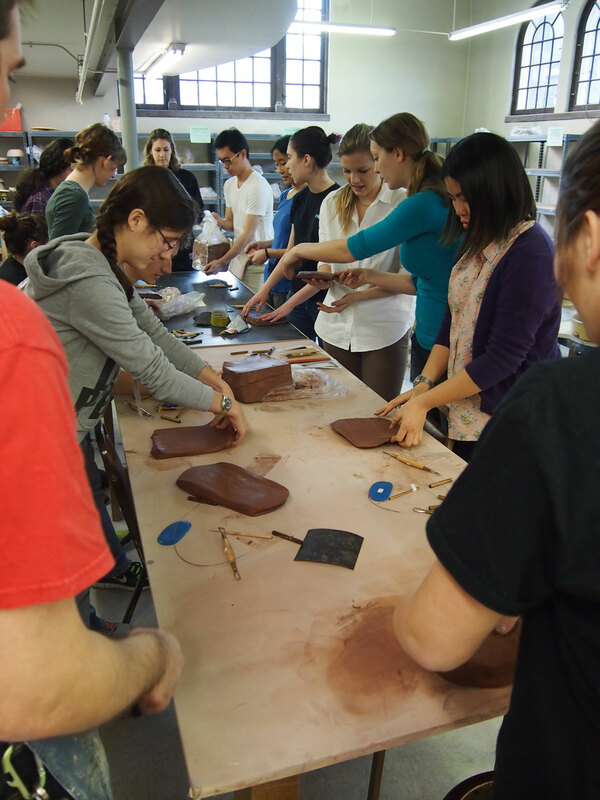 Over half the class had never worked with clay before, and, finding myself in that category, I was quickly overwhelmed by the words “bisque,” “shrinkage,” “absorption,” “leather-hard,” “bone dry,” “grog,” “slip,” and so on. But as examples of these different stages of clay were passed around, I began to gain a tactile understanding of the terms. Leather-hard clay felt sturdy, but could easily be marred. Bone dry felt more unyielding, yet still could surprisingly be scratched. Slip looked shiny and smooth, but generated friction against a finger. Matt pointed out our resources: a drying rack, wedging stations, slab rollers, and sinks. He then took us for a tour of the building, which was filled to the brim of various artists’ works. Some plain, some outlandish, and some as precisely decorated as our ancient pots. In the basement were fine examples of modern-day kilns, and amongst the metal beasts was our updraft kiln – large, clay slabs formed in cylindrical and domed pieces. Our next task was to produce small, clay tiles. Sponges, wires, needles, ribs, and trimming tools were passed around. Matt performed a thorough demonstration of slicing through a large block of clay using his wire, followed by a slapping of clay to table to thin it out, then a pass through the slab rollers to even it, and finally a four-sided cut to trace out a 5 x 5 inch square of clay. We quickly discovered that even slicing off the correct amount of clay was not as simple as Matt made it seem. We did our best to salvage our weirdly lopsided slabs by slapping them against the table, but soon discovered that they enjoyed getting stuck and cracked. Finally fed up, we moved on to the slab rollers, which revealed just how uneven our rectangles were. When we were able to cut out just one or two tiles, we had to “wedge” the remaining clay back into a usable state, which, after a few seconds, left our hands smarting and red. Matt shows us the base and wall thickness of a kylix’s (cup’s) bowl. Photograph by Haley Huang. Completely exhausted by cleanup time, we settled around one of the potter’s wheels to watch Matt throw the bowl portion of a kylix. What started out as 2.5 pounds of clay transformed beneath his fingers. First it became a dome, and then a tall trunk, and then a flat cylinder. It began to take a curved shape with sides growing taller and shorter as the depth of the bowl changed. It looked like magic to us. When the bowl was to his liking, he lifted it. Then, to the collective dismay of the room, cut it in half. He showed us the thickness of the walls and base before crushing it with his hands, laying waste to the image of what we hoped we could achieve after several months of relentless practice. We had all glimpsed, and felt in our shoulders, the long road ahead of us apprentices. Awesome post! And I completely agree, the second that new cup was sliced in half I could feel everyone’s hearts collectively break. And it was so easy for Matt to do since he, as a master potter, could probably make a ton of those in no time at all. I imagine that the master Grecian potters could do the same with the cups we have in our museums. And yet something so simple for a master (like making a cup) is a daunting task for us as brand new apprentices. There are so many different things we can do in every step that could ruin a tile or cup. It was hard to see that before we handled the clay ourselves. I think it is interesting that in your post you attribute human emotions to the clay, saying that “it enjoyed getting stuck and cracked”, since I also felt that the clay almost had a life of its own. This was especially evident in Matt’s discussion of the “memory” of clay – that if handled incorrectly, it will warp during firing even if it seemed correct when drying – and in his wheel-throwing demonstration, in which the clay seemed to grow and shrink of its own accord, with only the slightest guidance from his hands. As new apprentices, a very apt comparison, we found out that we are working, not with a simple lump of silica and alumina, but with a body of material that has its own unique character traits and must be handled with care. Learning to deal with the clay, I think, will be one of the most difficult aspects of this long road of apprenticeship. I think it’s important to note that, while everyone was certainly learning a great deal of new information, everyone was also having tremendous fun. Like you said, the majority of us have never touched unfired clay. And while the clay posed unanticipated difficulties, nothing was so disheartening that we weren’t looking forward in earnest to the weeks of trial and error. Baltimore Clayworks is a lovely environment for this journey to take place in; I was really impressed with the facilities, and everyone there seemed friendly. Great post Haley! You definitely captured the collective mindset of working with the clay. To add onto our experience touring the workshop, as we were looking into all of the individual workshops, I was wondering if ancient workshops might have been set up in a similar way. I say this because we know that–to a certain extent–the tools used by the ancients are very similar to the ones potters use today, so it might be interesting to consider other possible similarities. For example, looking into the different studios was like looking into different worlds. It was sometimes hard to believe that they were all working with the same medium. Would different ancient workshops exhibit these same individualizations and eccentricities? 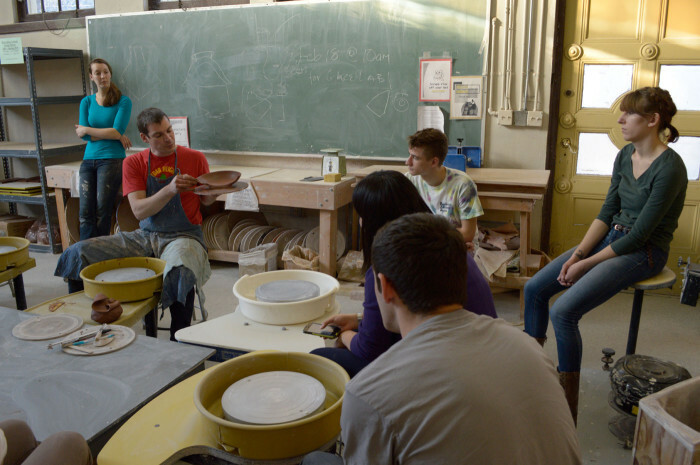 Did potters and artists work in close proximity to each other like those at Clayworks? Great post! When you mentioned the tour of the facilities, it reminded me of the impressive collection of kilns housed at Clayworks. Not only do they have a few gas-fired kilns, but they also own a massive outdoor wood-fired kiln that they operate nearly 35 days of the year! This cottage-sized contraption will be next to our buried kiln when we fire in the spring. When we happened upon the pieces of our kiln it seemed a bit overshadowed by all of the huge machines, but then Matt explained the tricky process and extensive experimentation that he and Professor Balachandran went through to arrive at this end, and I began to feel that we were lucky to have such a finished product in so short a time. Something I found interesting were the modern day tools used to shape clay including a rib, needle, wire, loop, and sponge. I was thinking about what would have been used to make these tools in ancient Greece and remembered an article I once read about how Egyptian potters made their own ancient potter’s ribs out of broken pieces of pottery (Baba, Masahiro. “Pottery-Making Tools: Worked Sherds from HK11C Square B4, Hierakonpolis.” In Egypt At Its Origins 2: Proceedings of the International Conference “Origin of the State, Predynastic and Early Dynastic Egypt”, Toulouse (France), 5th-8th September 2005, edited by Béatrix Midant-Reynes, Yann Tristant, J Rowland, and Stan Hendrickx, 7-20. Leuven: Peeters, 2008). I wonder if the Greeks used something similar. It’s interesting that the tools haven’t changed much in thousands of years. Thank you Haley for the post! I found Matt’s demonstration on the wheel most intriguing. He mentioned a push-pull effect where one has to balance the forces applied to the spinning clay. That is, if we push downward on the clay with one hand, we also have to control its sideways elongation with the other hand. As with many other aspects of life, striking a good balance is key to throwing a fine kylix indeed. The different stages of dry clay that you described (bisque, leather hard, bone dry) and the tactile/temporal markers of each will be very important as the class moves forward in finally sculpting the clay, refining its forms, and preparing it to be fired. The rough shape of the bowl is created on the wheel when the clay is still very wet. Once it dries to a certain extent, that form and the surface smoothness can be enhanced by carving away at a firmer clay. Even further air drying creates a more sturdy clay that one can manipulate more liberally and begin the process of assembling parts, applying slip, and finally firing. At all stages of pre-firing drying, the clay can be recycled. But once it is fired it can not. Having that grace period must have been very helpful for apprentices learning the ceramics trade. I think that one of the most remarkable aspects of Matt’s wheel demonstration is how quickly he was able to produce a perfectly symmetrical bowl (and he probably does it faster when he’s not addressing a large group at the same time). Assuming the Greek masters could make a pot in a similar amount of time, they must have been able to output an incredible amount of kylikes and other wares per day. This would be an interesting (and feasible) topic to pursue. If we timed Matt making different objects a Greek potter might make, and had a reasonable idea of what an ancient potter’s day looked like, we could estimate the number of pots thrown per day. Haley successfully portrayed our first experience with the 103 red earthenware clay. I was especially surprised by the balance of finesse and force needed to produce something as simple as a square tile. Wedging and throwing the clay requires aggression and body weight to manipulate the material into its desired form. But after the clay is essentially beaten into submission, it requires precision and as little contact as possible (even our fingertips can apply unwanted pressure). The thinness of the cups at the museum is truly beautiful, and replicating this effect as well as correct proportions will be challenging. Under the guidance of Professor Balachandran and Matt, I predict no other outcome than the manifestation of our enthusiasm into successful and accurate reproductions of the cups we are studying. I think another really interesting part of Matt’s demonstration was how he only worked in such a small section of the wheel. He said that the wheel can be divided up like a clock, and that you only work in about one quarter of it. Almost all of the action takes place in the lower left or right hand quarter, depending on which way the wheel is spinning. He made sure to point out that both hands are always being used at the same time and are always level with one another. Especially when lifting the pot, both hands have to be at the same height or else the pot won’t lift properly and risks ruining the vessel! The quote Haley chose from Hasaki’s work is so fitting for our class! While I might have some experience working with clay on the potter’s wheel, I am not nearly as experienced as Matt or Cami! I realize I still have much to learn, especially after our first day at Clayworks, when we took instruction on a very simple task- making slabs. Both Cami and Matt were very insightful on ways for me to improve my technique wedging and forming slabs- less body weight, more kneading with my hands, etc. Learning about technique from text is nothing like being able to see it in person. I can only imagine the speed and dexterity with which the ancient Greek potters were able to produce their kylikes. Wow! What a great experience for all you! Very exciting. When are you firing your pieces? Hi Bobbie, we will fire our vessels on April 8th (fingers crossed!). Thanks for your comment.